StencilGirl Talk: Trish McKinney: Embrace Your Hot Mess! Trish McKinney: Embrace Your Hot Mess! 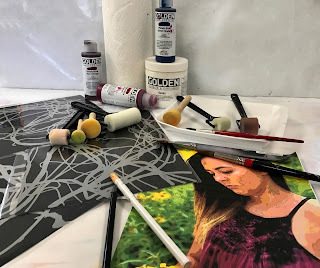 4 - Begin painting – first - prepare one styrofoam tray with white gesso & one tray with darker value colors - then use your stencils and move around the painting working around your subject matter, but sometimes overlapping lines too. True confession – I’m the President of the Hot Mess Club. 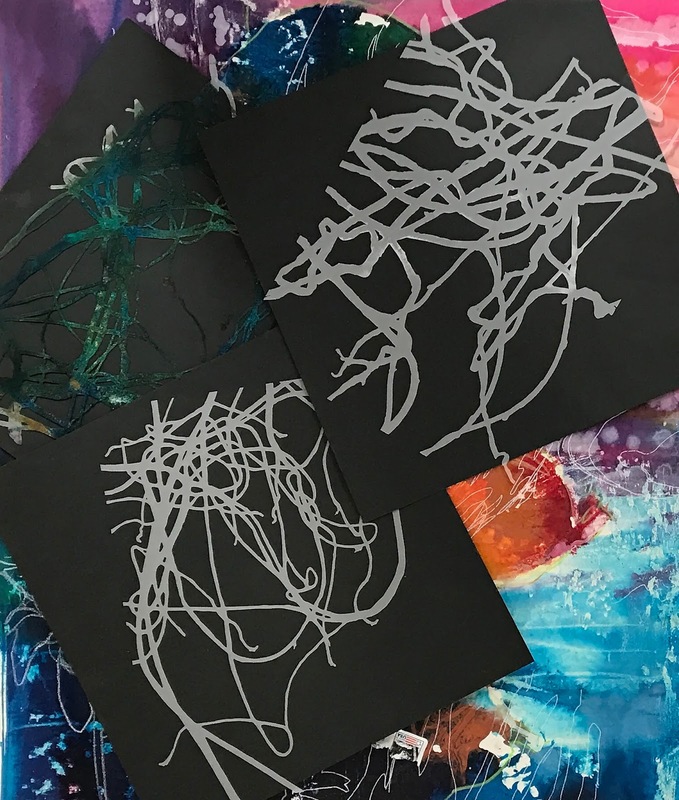 Shhh… One thing that means is that I have an unlimited supply of rejects – what I call, “hot mess paintings”!! I have 3 to 4 times more rejected paintings than I do perfected paintings (perfection is way over-rated)! This is the sad, sad truth. 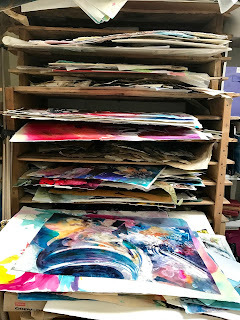 I happen to adore my piles and piles of imperfect paintings – they are like the wrinkles on my face and lumps on my body – I have earned every one of them the hard way! By that I mean simply that I believe in embracing my hot mess of a self and my hot mess paintings! These paintings represent a tangible, physical, and visual road map of where I have been on my artistic path. But then one day your excessively neat husband crosses the threshold of your messy studio and gets that look in his eye and mumbles something about a bonfire happening next time you leave town to teach. Eeeek! Well that got my attention! Rather than throw these rejects out or use them for kindling, I thought– “What if I upcyle and reinvent these pieces of paper? !” “What if” is always the beginning of something creative for me and my favorite 2 words to put together. Because this began the start of something magical and a metamorphosis…. 1 – Selecting a hot mess!…. Take a deep breath & go through your reject pile. Choosing the perfect imperfect painting is not that easy. If you are a hoarder (like me) you will always say to yourself “I will finish this piece later” and you will be tempted to save it back. So I have found it very useful to look at my pieces upside down. This helps me to look at the piece more objectively and not get emotionally attached. Things to look for…when you are looking at the piece upside down, look for great lines, shapes, colors, and/or value – anything that looks intriguing. 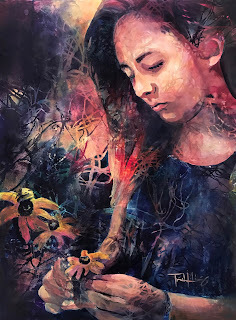 Do not look at the subject or the emotional value – ie, a failed portrait of your child, a place where you have fond memories, your favorite flower, etc… will be very difficult to push past and paint over. So be objective and don’t get too attached. 2 – Select a great reference photo & draw it in…. Turn your hot mess painting in all different directions, usually one way will speak to you and seem more pleasing. Turning it sideways or upside down helps when painting over it to no be influenced by existing shapes. This part of the process is mostly intuitive - go through your reference photos and select something that you are are passionate about, comes to mind when viewing the hot mess painting, maybe a reference photo that has similar colors or shapes. Be sure to select a subject that is very simple. Complex subject matter does not lend itself to this technique. Sometimes it is fun to draw out something arbitrary or abstract. Once you select your subject matter draw it out. If the painting has mostly darker value colors, I like to use a white china marker so I can see my lines. 3 – Selecting your stencils…. So now you have your hot mess of a painting with a great drawing. Look through your pile of stencils and select 2 to 3 different ones that go together. Be sure to select organic or abstract shapes. For my example, I used the 3 from my Bare Wisteria Vine collection of stencils at StencilGirl. 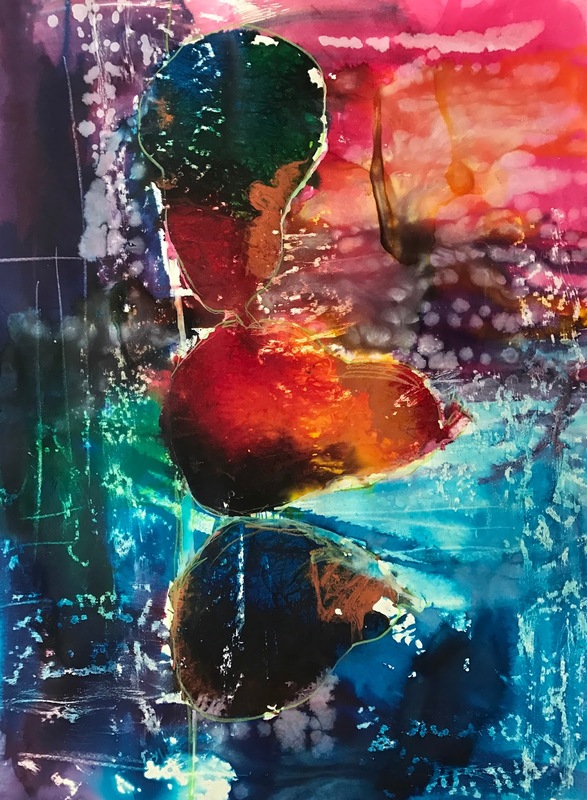 I chose them because they reminded me of the way the hair was flowing and the shapes in the drawing – it also mimicked the pears’ shapes in the original hot mess painting. 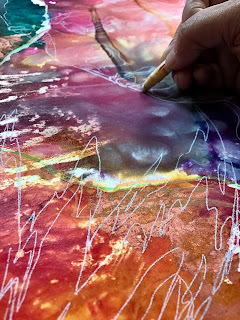 4 – Begin to paint…. This part of the process should intuitive and spontaneous! You have done all of the planning out, drawn out your subject, etc… now comes the fun! Creativity never lives in predictability or excessive planning for me. So after planning out the composition, I don’t plan too much from this stage on. Next, I begin to use my stencils. 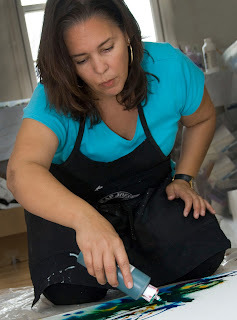 I will have 2 Styrofoam mixing trays – one with white gesso, the other with darker value colors and a neutralizing color to make them gray. I use Golden Fluid Acrylic paint for this tray. I have several sponge rollers and paint dabbers close by as I like to mix my colors and use them dry. Now it is time to begin painting. I will use my sponge rollers like my paint brush, alternating between using white gesso & dark values. I call this “pushing & pulling” and playing with color value. 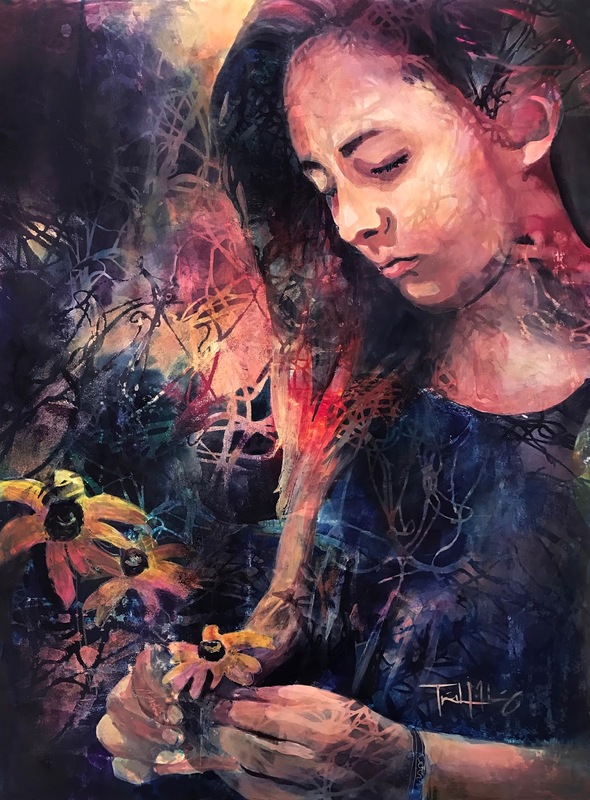 Have fun with this part of the process and be sure to work around the focal point in your composition – don’t overdue the pattern and allow it to flow around the painting. 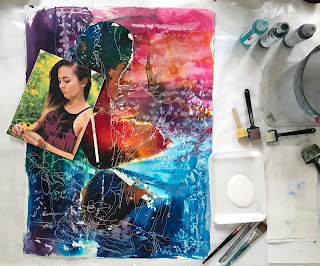 Note: while it is true I began this project with a planned out composition, many times I just start covering up and let the painting tell me what to do next and working completely abstract and intuitively. That is fun as well. 5 – Build it up…. Now it is time to build up the values until your subject matter or composition is well-defined. I will take my brush working around the painting to pull out my lights and darks. Integration of all of the areas of a painting is important. I like to finish the painting by using the stencils to make sure all of the areas of the painting are connected. Have fun embracing your hot messes and remember…. You made something glorious out of what you deemed a mess. I have to say that what you call a mess, most people would probably be proud to display. Wow! I ♥️ your process and results of your piece! So many delicious, interesting layers! Take care and STAY POSITIVE! This is a fabulous tutorial! I love the finished painting!